We notably performed the first radio-frequency study of field-effect transistors made of solution-based graphene and the first study of graphene devices combining speed and flexibility. The study shows that, when handled in solution (i.e. in the form of an ink), graphene is a very promising material for printed electronics, a field presently dominated by organic semiconducting materials intrinsically limited to the low MHz frequency range by their low carrier mobility. Collaboration IEMN-Lille and Northwestern University. 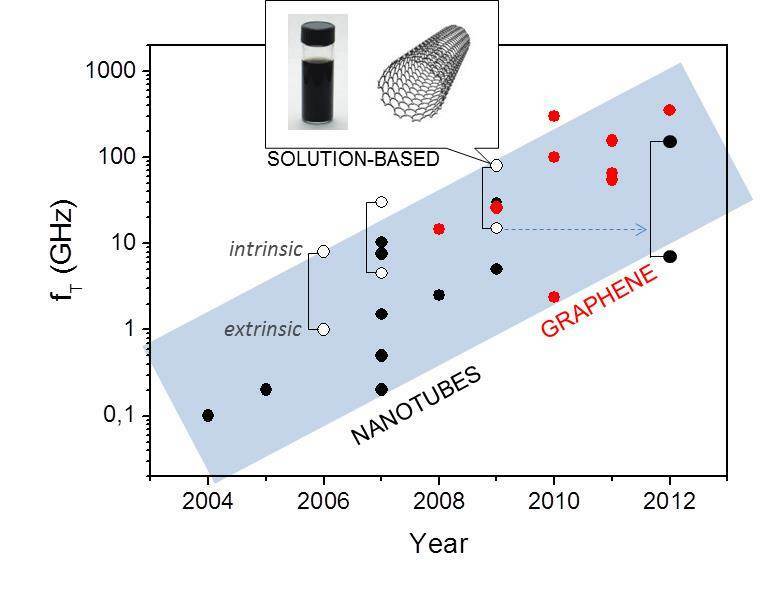 The exceptional carrier mobility in carbon nano-materials (nanotubes and graphene) makes them appealing for the study of devices operating at high frequency. However, building HF transistors from high-impedance nanoscale objects is challenging. In the recent years, the LEM has intensively studied the high frequency performances of carbon-based electronic devices. In particular, in 2009, we reported the highest cut-off frequency (fT=80 GHz) for a carbon nanotube transistor. Only in 2012, IBM reported a slightly higher fT result based mostly on a better minimization of parasitic capacitances (their as-measured or extrinsic fT being in fact lower, see figure). L. Nougaret, H. Happy, G. Dambrine, V. Derycke, J.-P. Bourgoin, A. A. Green, M. C. Hersam, "80 GHz field-effect transistors produced using high purity semiconducting single-walled carbon nanotubes", Appl. Phys. Lett. 94 (2009) 243505. Since 2008, graphene devices have been reported with improved cut-off frequencies but we estimate that on rigid substrates, graphene FETs (based on CVD or epitaxial graphene) will hardly compete with III-V semiconductors for future analog HF electronics. Conversely, graphene handled in the liquid form (as an ink) has the required physical properties to compete with organic materials for large scale / low cost printed analog electronics. We conducted the first study of the RF and mechanical performances of solution-based graphene flexible transistors. By assembling from solution dense assemblies of monolayered graphene flakes (sorted by density gradient ultracentrifugation at Northwestern University) on polyimide substrates, we produced flexible FETs having as-measured fT up to 2.2 GHz (8.7 GHz after de-embedding of the parasitic capacitances). The full S-parameters characterization notably allows evaluating separately the performances of the electron and hole currents and to establish an equivalent circuit model for such device. The study shows that when compared with the conventional materials of printed electronics (organics), solution-based graphene is indeed a very serious competitor. 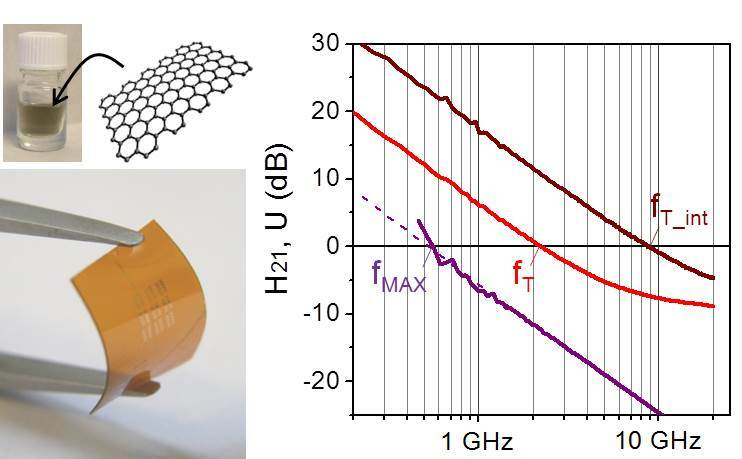 However, the semi-metallic character of graphene restricts its use to analog RF devices. This is the reason why, we now follow up this activity with the study of 2D layered semiconductors (in particular MoS2 single-layer flakes produced at Northwestern University) aiming at achieving fast and flexible FETs with performances adapted to digital electronics (i.e. with high on/off ratio and complete current saturation in their output characteristics). C. Sire, F. Ardiaca, S. Lepilliet, J.-W. T. Seo, M. C. Hersam, G. Dambrine, H. Happy, V. Derycke, "Flexible GHz Transistors Derived from Solution-Based Single-Layer Graphene", Nano Lett. 12 (2012) 1184.